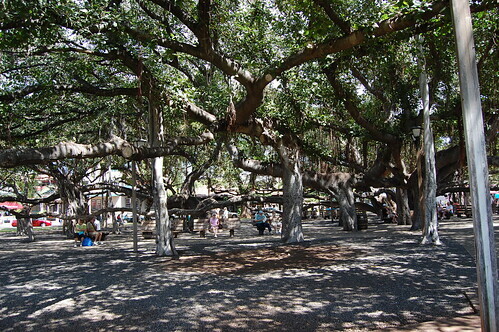 Weasel's Journey: The banyan tree. 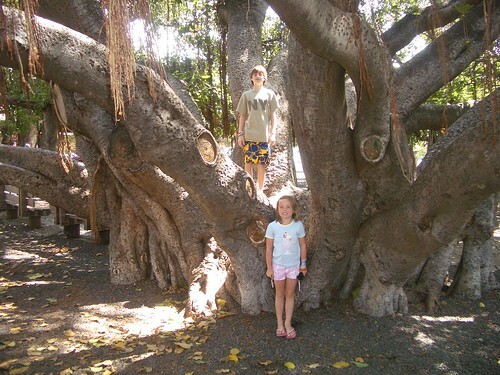 The tree is amazing - I want one. We were in Dallas, Grapevine actually, and as I sped by Moc******rd exit I thought of trying to find your house and pop in with Harry. (not for public post, necessarily) Not really sure if that was the right exit, but it looked familiar. Tourn are up there 1-2 times per year, generally in Jan-Mar. Convince Kim to come next year - Har, Kate and I drove up Fri night, and back on Sat at noon. How fun that you take that photo every year. Can't wait to hear all about your trip and how V did at home. I love that you take these pictures on each trip. Very smart, Mama! I wish I was an organized mom--I never seem to get pictures of anything. We've stayed at the Four Seasons, the Fairmont Kea Lani and Polo Beach Club condos (the white ones right on the beach next to the Fairmont). That's where we're staying again this Thanksgiving. They were built in the 1980's, so they're right on the beach. Most of them have been gutted and renovated. We love that area, too. 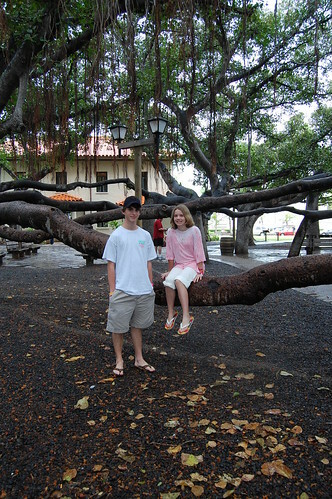 We stayed at the Ritz at Kapalua in Sept. and it was 10 degrees colder, rainy and windy the entire time. Definitely back to Wailea for us. We love that walking path--it's the perfect distance to the Starbucks hut! I've enjoyed my blog break, just commented on a few thing that caught my eye on reader, but think I will have something to blog about after Easter. Thanks for your response. We have many of them around here...the biggest one I saw was in Ft. Myers at the Eddison House! WOW to that tree. And what cool pics to have! 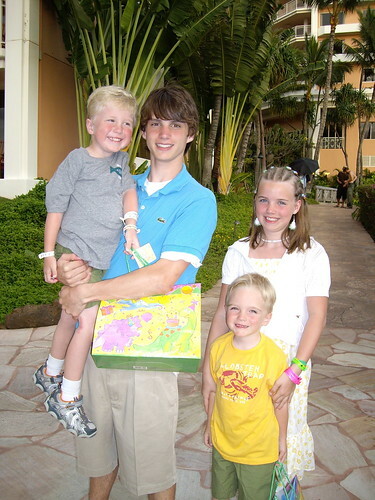 Your kiddos are adorable! I loved seeing Dots grow up through your pictures. I think it's so clever that you do one every year. 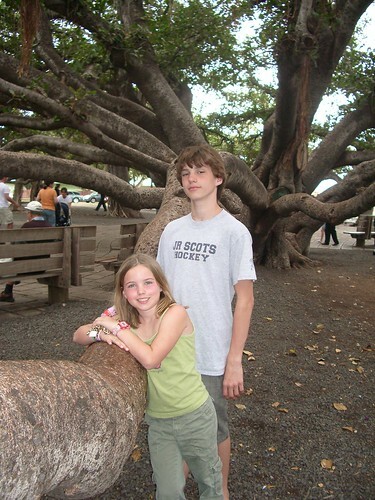 I think Hockey Boy's friend will love U of R and being part of the athletic department But I am a little biased. ;-) The guy I dated all through college played on the offensive line. 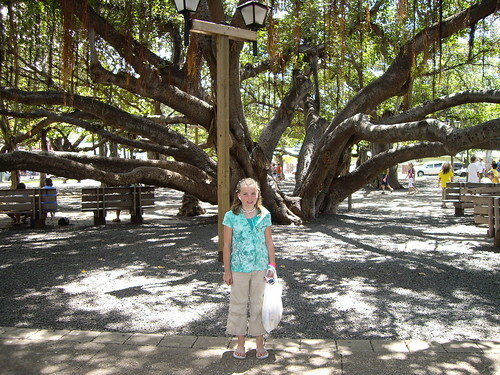 That banyan tree in Lahaina is so cool. Darling pics! We do a similar thing with first day of school pics in front of our armoire. It is always so fun to compare pics from year to year. Thanks for your sharing! What an amazing tree. Isn't it fun to look back and see how much your children grow from year to year? What wonderful memories you're capturing. Thank you for the sweet comment the other day. You are just precious. I have to tell you that I absolutely adore Vivan's name and I think it suits her beautifully. I love the pictures. I know that making memories and having traditions like this will be so important to me one day. I hope I can be as diligent as you in making sure that I keep them up! I start so many things with good intentions, only to have them fall by the wayside. Have a wonderful Thursday. 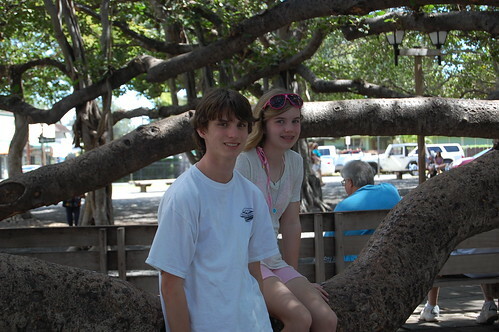 There is a tree like that in hilton Head...probably a different variety...but I always get the kids photos there too.